Obituary – Barnett, Clara Selma (Wilde) « Perry High School Alumni Association, Inc.
A former Mrs. New Mexico, Clara “Claire” Selma (Wilde) Barnett, 94, died Oct. 1, 2015, and she will be interred at 11:15 a.m., Friday, June 3, at the National VA Cemetery in Santa Fe, N.M., with pastor Warren Graff of Grace Lutheran Church in Albuquerque, officiating. 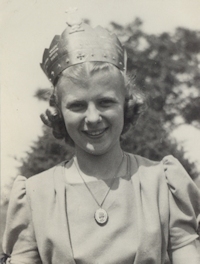 Claire, a longtime New Mexico resident of Santa Fe, Carlsbad and Albuquerque, was born in Garber, OK, and graduated from Perry High School in 1938, where she fondly recalled being elected Band Queen. She married her high school sweetheart, W.H. “Dub” Barnett of Perry the same year and following his US Naval service in World War II, she and Dub relocated to New Mexico where they enjoyed 75 years of marriage while Dub worked in the lumber/building goods business. Dub preceded her in death in 2014 at age 95. Clair loved her adopted New Mexico. She was active in various civic organizations, including service groups in local Lutheran congregations. She loved culinary entertaining. In 1956, while residing in Carlsbad, she was crowned Mrs. New Mexico and represented the state in the National Mrs. America competition at Eleanor Gardens, Florida, sponsored by the National Gas Association. In that competition she won first place in Pie Baking, the National Civil Defense award and was honored by her peers as Mrs. Congeniality. She is survived by two sons, William H. “Bill” Barnett of Edmond, OK and Douglas Barnett and his wife Karen, of Henderson, NV; four granddaughters and two great granddaughters.Memorials can be made to Grace Lutheran Church, Albuquerque, New Mexico.